Swimming pool accidents can bring about devastating injuries. Swimming accidents claim the lives of over 1,000 children each year and accidents in swimming pools account for over 1/3 of those fatalities. Wading pools can be dangerous as well since children can drown in less than 2 inches of water and in less than 5 minutes! Many adults also die or suffer catastrophic injuries as a result of swimming accidents every year. Another horrible injury which can occur is when a swimmer comes too close to an uncovered drain. Drains are attached to powerful pumps which can trap victims underwater. In some gruesome cases, the pump is so powerful that the victim is disemboweled. It is the responsibility of the pool owner to keep the pool safe and free from defects, such as broken drain covers. It has also been determined that some drain systems are defective, opening the way to possible product liability claims against the drain manufacturer. Swimming pool chemicals can also cause injury in various ways, such as burns from excessive chemicals in the pool or burns from the pool chemicals outside of the pool. Chemical burns are often caused by the carelessness of the person responsible for maintaining the pool and securing the chemicals. The liable parties may include the property owner, the pool maintenance company, or the governmental entity, in the case of public pools. Not all swimming pool accidents result in drowning or catastrophic injury. A common swimming pool injury involves slips and falls in the pool area. Obviously these areas are often wet from splashing water. Therefore, they must be properly designed and made with the proper type of concrete to help prevent slips and falls. 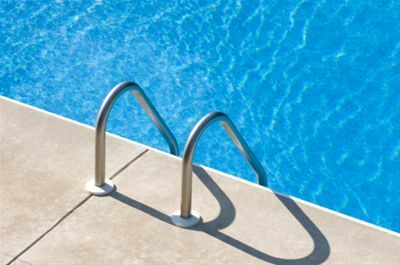 In the summertime, swimming pools open to the public, such as city pools or shared pools like those in an apartment or condominium complex, can become especially slippery from spilled sun-screen or other materials. It is the responsibility of the pool owner to ensure that the pool and the surrounding deck are properly maintained during times of heavy use. Contact the Law Office of Eduardo A. Brito for a free consultation regarding your swimming pool accident and the injuries you suffered. You can reach us by telephone at (626) 463-7076 or by e-mail. An evening appointment is available upon request, as is a home or hospital visit if your injuries prevent you from traveling to our Pasadena office.